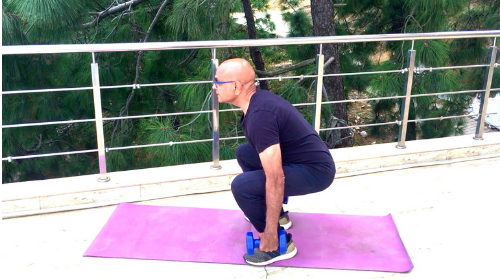 Dumbbell squat, the king of lower body exercises, is a compound exercise. No other exercise recruits more muscle below the waist than doing the squats with dumbbells. It strengthens quads, hamstrings, hips & glutes and makes the lower body stronger. This compound exercise engages core and involves stabilizing muscles as well. You would need good core strength & ankle mobility to achieve full range motion. In this article you will find how to do a perfect dumbbell squat, tips, step-by-step instructions and a VIDEO demonstrating correct start position & movement towards the end of this article. How To Do Dumbbell Squats With Correct Form? Stand up straight with your feet hip to shoulder-width apart with the toes slightly pointed outward. Hold a dumbbell on each hand with arms fully extended by your sides. Palms facing the side of your legs. Tip: Maintain your head up at and keep a straight back at all times. Don’t try to look down as that can make you off balance. (i) Brace your abs, push your hips back and lower your torso slowly until your thighs are parallel to the floor. During the movement, maintain hands next to your sides, heads up with a straight posture. (ii) Pause at the bottom, and then raise your torso back up to the starting position by pushing against the floor with the heel of your feet while you straighten your legs. This completes one rep. Do the desired number of reps.
(i) Do not allow your knees to go beyond your toes as it would put undue stress on the knees. (ii) Never let the dumbbells droop your shoulders. Make sure to keep your shoulder blades squeezed together all through the movement. (iii) Do not allow the knees to cave inward. Make sure to put pressure on the outside edges of the feet & squeeze glutes all through the movement. (iv) Be prudent with the dumbbell weight that you are going to use. If in doubt, use less weight rather than more. The squat is a safe exercise but only if performed correctly. You may use a barbell instead of dumbbells. To Make Dumbbell Squat Easier: Do a half squat or use lighter weights and gradually work your way to a full squat as you gain strength and improve mobility. Alternatively, do body or air squats without using dumbbells. To Make Dumbbell Squat Harder: You can use heavier dumbbells. Next articleHow To Get Rid Of Belly Fat After 60?